Charles Slichter was Professor Emeritus of Physics and Chemistry at University of Illinoia, Urbana-Champaign (1997-2018). His research interests included condensed matter physics, nuclear magnetic resonance, and superconductivity. January 21, 1924Birth, Ithaca (N.Y.). 1943 – 1946Research Associate, Underwater Explosives Research Laboratory, Woods Hole Oceanographic Institution. 1946Obtained AB in Physics, Harvard University, Cambridge (Mass.). 1947Obtained AM in Physics, Harvard University, Cambridge (Mass.). 1949Obtained PhD in Physics, Harvard University, Cambridge (Mass.). 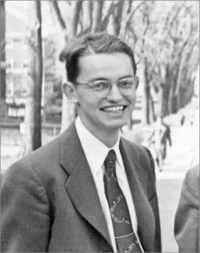 1949 – presentInstructor in Physics (1949-1951); Assistant Professor of Physics (1951-1954); Associate Professor of Physics (1954-1955); Professor of Physics (1955-1997); Professor of Chemistry (1986-1997); Member, Center for Advanced Study (1988-1997); and Professor Emeritus of Physics and Chemistry (1997-present), University of Illinois, Urbana Champaign, Urbana (Ill.). 1964 – 1969Member, President's Science Advisory Committee (PSAC). 1969Awarded Irving Langmuir Prize in Chemical Physics, American Physical Society. 1969Fellow, American Academy of Arts and Sciences. 1970 – 1995Member, Harvard Corporation, Harvard University. 1975 – 1984Member, National Science Board. 1975 – 1997Member, Board of Directors, Polaroid Corporation. 1996Awarded Oliver E. Buckley Condensed Matter Prize, American Physical Society. 2007Awarded National Medal of Science. February 19, 2018Death, Boulder (Colo.). Second Wife, married 1980. Co-edited "Solid state physics in the People's Republic of China." Advised by Slichter at University of Illinois, Urbana-Champaign. Advised by Slichter at University of Illinois, Urbana-Champaign, "Nuclear magnetic resonance in hydrogen-mental systems." PhD advisor at Harvard University, "A study of microwave absorption in paramagnetic solids," and both worked on President's Science Advisory Committee (PSAC). Both employed at University of Illinois, Urbana-Champaign and President's Science Advisory Committee. Both worked on President's Science Advisory Committee. Both worked on President's Science Advisory Committee (PSAC) and at University of Illinois, Urbana-Champaign. Professor of Chemistry and Professor Emeritus of Chemistry. Research Associate, Underwater Explosives Research Laboratory. Received 1969 Irving Langmuir Prize in Chemical Physics and 1996 Oliver E. Buckley Condensed Matter Prize. Obtained AB (1946), AM (1947), and PhD (1949). Principles of magnetic resonance, with examples from solid state physics. Solid state physics in the People's Republic of China : a trip report of the American Solid State Physics Delegation : submitted to the Committee on Scholarly Communication with the People's Republic of China / edited by Anne Fitzgerald and Charles P. Slichter. Charles Slichter University of Illinois College of Engineering obituary.